Excerpt from "A City Herbal"
Botanical Description: Blackberry canes (as the stems are called) may be trailing, arched, or upright. 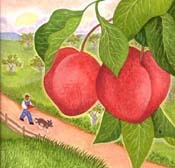 They are quite flexible and sometimes bend down to the ground and root at the tip. Upright canes may grow more than six feet tall. The compound leaves are dark green with three- or five-lobed leaflets. The are variable in size and shape and have toothed edges. The illustration is a typical example, and both three- and five-leafed specimens grew on the same plant. Blackberry blooms from mid- to late June. The masses of white or pale pink flower clusters make the plants conspicuous and easy to spot and remember for future berry picking. In the eastern part of the United States, Blackberries start ripening toward the middle of July. They are small, green, hard, and sour at first, becoming larger, and when fully ripe, juicy and sweet. Ripe and unripe berries frequently appear on the plants at the same time. More than two hundred species of Blackberry are found in the United States. Some are low, trailing, and vinelike; others are large bushy plants. In the Northeast, purple-black berries are most common, but other varieties may be red or even white when ripe. Everyone loves the delicious fruit, and Blackberries of one kind or another can be found throughout the United States. Blackberries are perennials that reproduce from seeds. The bushes are usually armed with thrones best described as vicious; they seem to deliberately reach out and grasp the clothing and skin and can inflict painful scratches on a careless picker. The thorns themselves have a nasty tendency to break off at the tip and become embedded in the skin. The eating more than makes up for the picking, however. The only other way to obtain Blackberries is to buy them, and they can be purchased only at gourmet greengrocers for a brief time during the summer, at a cost of about two dollars for a mere half-pint! Allow 1 heaping tablespoon of dried Blackberry leaves per cup of boiling water, cover, and steep 10 minutes. Strain and add honey or sugar to taste. You can combine equal amounts of dried mint and dried Blackberry leaves—and excellent combination. Dried Blackberry-leaf tea makes an excellent astringent wash for oily skin. Prepare as for Blackberry-leaf tea, using ¼ cup of leaves. Let cool to tepid, strain, pressing out all liquid, and pat gently on your skin. To dry Blackberry leaves: Pick leaves dearest the growing tips (from midspring to midsummer) in the morning when the dew has dried off. Lay on screens or hang up in small bunches out of the sun, but in a dry airy place. When thoroughly dry, they will be crisp and brittle. Strip the whole leaves carefully from the stalks, and put away in jars. The leaves should retain their green color. To best preserve the active properties of the plant, do not crumble the leaves until you are ready to prepare the tea. To prepare a tea with the dried green Blackberries, use 1 heaping tablespoon of berries. Pour boiling water over them, and allow them to steep 15 minutes. Strain, and add sugar or honey to taste. I have found this tea useful to ease mild stomach upsets. To dry berries: Generally speaking, it is the green, unripe rather than the ripe Blackberries that are dried because the valuable astringent principle is strongest in the unripe berries. Make sure clusters are free from moisture when picked, and dry as described above for the leaves. They will take longer than the leaves, and will shrivel considerably. Put away only when thoroughly dry, or they will mold. Blackberries are delicious in apple pie. Add about 1 cup or more if you wish to pie filling. To freeze berries: Was gently and let dry thoroughly before freezing in plastic bags. It is not necessary to thaw before using. Blackberry plants are a fine source of natural dye. A terra cotta color can be obtained from the leaves, and purple-brown from the ripe berries. See the Appendix, page 171, for instructions on preparing dye. by Maida Silverman. The wild plants of the city are potent herbal medicines and nutritious wild edibles, as well as sources of comfort, fiber, and dyes. Learn to recognize and use 34 of them. 192 pages, index, illustrations. The Dreaming in Color™ Luman Deck is a bridge that is specifically intended to help the user develop their intuitive and psychic abilities through the use of meditative, intuitive and psychological expansion and color-soaked dreamscape imagery. 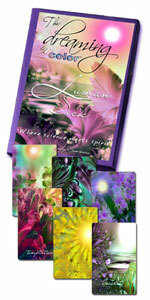 60 vibrant 3" x 5" cards on a rich, lustrous satin matte stock, beautifully boxed (the box is a lush purple, of course). User guide included.